Skin cancer is the most common cancer in the United States, with more than two million people being diagnosed each year. While most cases of skin cancer can be successfully treated if found early, the large and growing number of people getting the disease makes skin cancer a serious concern. Medical costs alone to treat skin cancer are estimated at almost $2 billion annually. More people were diagnosed with skin cancer in 2009 than with breast, prostate, lung, and colon cancer combined. About 1 in 5 Americans will develop skin cancer during their lifetime. Melanoma is one of the few cancers that continue to have an increasing number of cases each year. Melanoma is the second most common form of cancer for adolescents and young adults (15-29 years old). For people born in 2005, 1 in 52 will be diagnosed with melanoma— nearly 30 times higher than for people born in 1930. There are 3 main types of skin cancers: keratinocyte cancers (basal and squamous cell skin cancers) and melanomas. 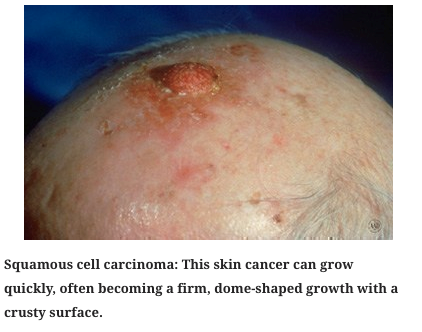 Basal and squamous cell skin cancers are the most common cancers of the skin. They develop from cells called keratinocytes, the most common cells in the skin. 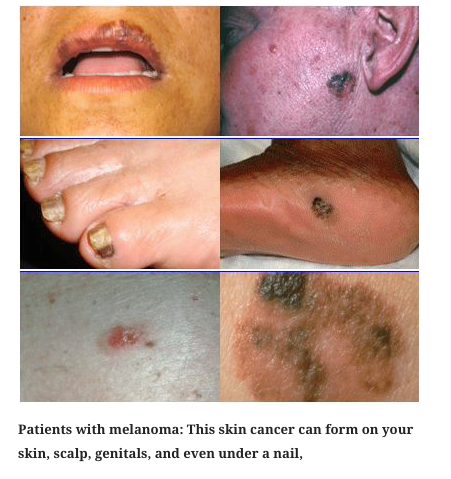 Melanomas are cancers that develop from melanocytes, the cells that make the brown pigment that gives skin its color. Melanocytes can also form benign (non-cancerous) growths called moles. There are several other types of skin cancers as well, but these are much less common. It is important for doctors to tell these types of skin cancer apart, because they are treated differently. 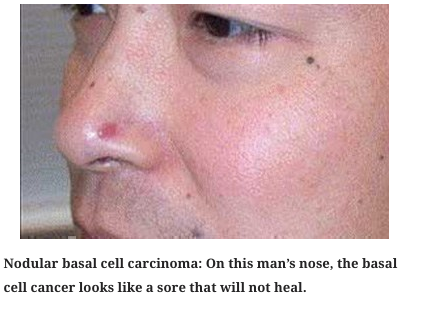 It is also important for you to know what melanomas and basal and squamous cell skin cancers look like. That way, you can find them at the earliest possible stage, when they are cured most easily. Skin cancer is the most common of all cancer types. More than 2 million skin cancers are diagnosed each year in the United States. That’s more than cancers of the prostate, breast, lung, colon, uterus, ovaries, and pancreas combined. The number of skin cancer cases has been going up over the past few decades. The good news is that you can do a lot to protect yourself and your family from skin cancer, or to catch it early enough so that it can be treated effectively. Most skin cancers are caused by too much exposure to ultraviolet (UV) rays. Much of this exposure comes from the sun, but some may come from man-made sources, such as indoor tanning lamps. Finding possible skin cancers doesn’t require any x-rays or blood tests — just your eyes and a mirror. If skin cancer does develop, finding it early is the best way to ensure it can be treated effectively. What if I find something suspicious? It’s important to know the difference between a harmless mole and a spot that might be a melanoma. A normal mole is most often an evenly colored brown, tan, or black spot on the skin. It can be either flat or raised. It can be round or oval. Moles are usually less than ¼ inch across, or about the width of a pencil eraser. Moles can be present at birth or they can appear later. Several moles can appear at the same time. Once a mole has developed, it will usually stay the same size, shape, and color for many years. Moles may fade away in older people. Most people have moles, and almost all moles are harmless. But it is important to recognize changes in a mole — such as its size, shape, or color — that suggest a melanoma may be developing. Be sure to show your provider any area that concerns you. A qualified provider should be able to identify any suspicious areas you may have. If your provider suspects you might have skin cancer, he or she will use one or more of the following methods to find out.